Last summer, ABC revived To Tell the Truth and other classic game shows. They did well enough in the ratings to be renewed. This time around, the network is airing To Tell the Truth during the regular television season, when there’s a lot more competition. How will the game show perform this time around? Will it be cancelled or renewed for a third season on ABC? Stay tuned. 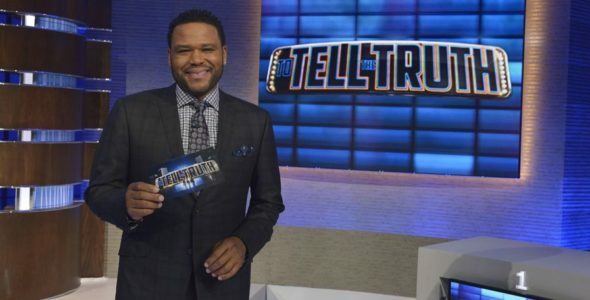 Hosted by Anthony Anderson, this version of To Tell the Truth features a panel of four celebrities who are presented with three people who all claim to be the same person with the same incredible talent, job, or achievement. One is sworn to tell the truth while the others are not. Panelists this season include Jalen Rose, Ashley Graham, Angela Kinsey, Donald Faison, Lara Spencer, David Arquette, Tom Bergeron, Sherri Shepherd, Kal Penn, Justin Long, Nikki Glaser, Adam Rodriguez, Ross Mathews, Iliza Shlesinger, Cedric the Entertainer, Martha Plimpton, and Jamie Chung. Anderson’s mother, Doris, returns to add her own commentary. For comparisons: The first season of this ABC version of To Tell the Truth averaged a 1.03 rating in the 18-49 demographic with 4.70 million viewers. What do you think? Do you like the To Tell the Truth TV series on ABC? Do you think it should be cancelled or renewed for a third season? 5/16 update: ABC has renewed To Tell the Truth for season three. Details here. This is a fun show but have to agree the mother of A Anderson gives the show a ghetto feel that is out of place. I miss Betty White from season 1 but still enjoyable. Hope it lasts along with Pyramid, Match Game, and Gong Show–Will Arnett, ken Jeong, and Zack G should be permanent hosts as they were hilarious in episode 1 !!! Do not like the format particularly with Doris. Don’t see the point. She’s not funny and her commentaries are not necessary. I stopped watching because of this.